The Dream Defenders are young women and men, mostly Black and Latino/a, including some undocumented immigrants. They aim to “fight the criminalization of our generation by directly confronting the sources, sponsors and supporters of it.” Their immediate demand is for Florida to pass the Trayvon Martin Act, to ban racial profiling, end the school-to-prison pipeline, and repeal the Stand Your Ground pro-vigilante law. Martin’s murder and Zimmerman’s trial exposed how deeply racist U.S. society remains. This “civilization” indicted itself and its pretense to be post-racial, which is sanctimoniously trumpeted by its legal system, from the hallowed heights of the Supreme Court down to the police officer harassing people on the streets of Harlem. As a self-appointed gun-toting neighborhood watch volunteer in Sanford, Fla., Zimmerman singled out Martin because he was a young Black man. Against police advice, he followed Martin, and ended up killing the teenager with a bullet to the chest. After barely investigating, police released Zimmerman without charge. When demonstrations and coast-to-coast outrage forced Gov. Scott to bring in a special prosecutor, he chose Angela Corey, a political veteran who made a show of charging the killer–and then threw the case. Judge Debra Nelson forbade the prosecution to mention racial profiling or to call on a voice expert to testify that it was Martin heard calling for help during a 911 call, but allowed the defense to use evidence that Martin had a small amount of marijuana in his system. Marissa Alexander, an African-American woman in Jacksonville, Fla., who fired a warning shot into the ceiling after being threatened by her husband, hurt no one but was sentenced to 20 years in prison last year. It was Angela Corey who threw the book at her despite Alexander’s husband’s testimony corroborating her story. 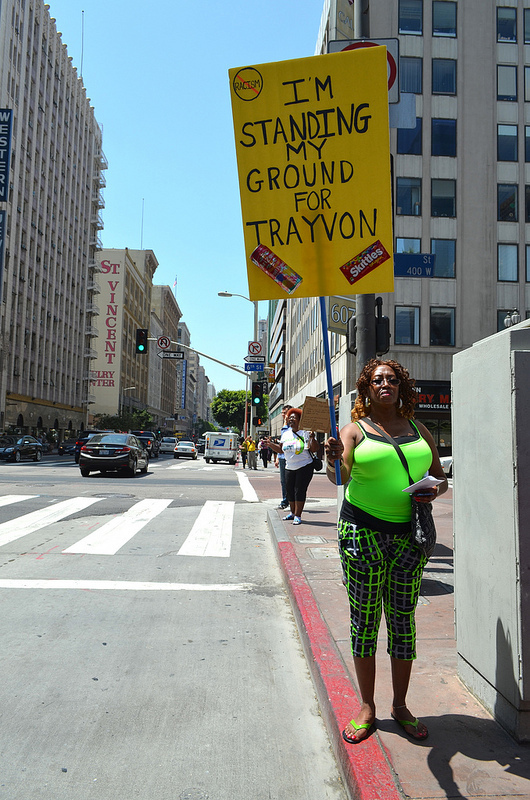 The judge would not allow a “stand your ground” defense. Two weeks after Zimmerman’s acquittal, 46-year-old white man Michael Dunn asked a carful of Black teenagers in Jacksonville to turn their music down. Shortly afterwards, he opened fire on the unarmed teens, killing 17-year-old Jordan Davis, then drove off. He now claims self-defense. In Winter Springs, Fla., Owen Eugene Whitlock, a 62-year-old white man, shot and killed his daughter’s boyfriend, Jose Ramirez, in 2009. Ramirez had angrily told Whitlock that he would not be disrespected and was slowly walking toward him with fists raised. No charges were filed. The vast majority of killings with impunity are perpetrated by police. Almost one African American is killed each day by law enforcement, security guards, or vigilantes. (Seewww.operationghettostorm.org.) Those who live in targeted communities already know a history of unpunished police murders, from Raymond Herisse in Miami to Rekia Boyd in Chicago, from Juan Chavez in Los Angeles to Ramarley Graham in New York. Vigilantism and lynching have long been accepted as unofficial, and sometimes official, extensions of the state’s powers of violence used to maintain the country’s racialized class structure. Three centuries ago, white men in bands patrolled Southern states to fight the never-ending escapes and rebellions of slaves. Some states organized these slave patrols as militias, which became a principal motivation for the Second Amendment’s recognition of militias’ right to bear arms. That was just one of the ways in which the incompleteness of the American Revolution resulted in the enshrinement of slavery in the Constitution. “The three basic constituents of the betrayal, that is to say, the unfinished state of revolution, were: 1) the freedmen did not get ‘the 40 acres and a mule’ they were promised; 2) the old slave owners did get back their plantations and thus the power to institute a mode of production to suit cotton culture; and 3) the crop lien system was introduced with ‘new’ labor: sharecropping…. On this economic foundation, the slave patrols and the slavemaster’s summary justice were replaced by the growth of the prison system, with the forced labor of Black convicts. Its adjunct, the KKK and lynch mobs, were proof of the ceaseless struggles of African Americans for freedom. When the Jim Crow system was finally destroyed by the Black revolution of the 1960s, the reaction against that movement and against the other freedom movements it inspired, seized upon the movement’s incompleteness. The state unleashed a “war on crime” and a “drug war” involving demonization of Blacks and Latinos and an explosive growth of the prison system. The number of people in prisons and jails shot up from 338,029 in 1970, to 2,424,279 by 2008. About two thirds are people of color. A new level of rebelliousness of Latinos–from farmworker strikes to urban youth revolts to solidarity and communication with revolutionary upheavals in the Americas–brought them into the sights of the injustice system alongside African Americans. This current phase of racialized class “justice” begins at school, where Black students are 3.5 times as likely to be suspended or expelled as whites. Black youth referred to juvenile court are much more likely to be punished, including being tried as adults. Black drug users are more than four times as likely to be incarcerated as white. In some U.S. cities, 80% of young Black men have criminal records. The criminal injustice system starts early and works overtime to brand African-American and Latino youth with a racially biased stigma, under a semblance of colorblind objectivity. The stigma sanctions second-class status in jobs, housing and voting rights, and is self-righteously used by pundits, politicians and everyday racists to defend the exploitative class structure of our society. American Civilization on Trial shows that decisive turning points in U.S. history have come about when Black masses and white workers coalesced in their quest for freedom. To give up on such coalescence is to abandon revolution, and therefore to accept this murderous capitalist order. What is needed instead is to prevent yet another revolution from remaining unfinished due to the lack of a unifying philosophy. Today’s resistance to the criminal injustice system and vigilantism occurs in the context of simmering discontent with the overall crisis-ridden society, marked by social retrogression and economic depression for the majority, as against the capitalists raking in their profits. Resistance has also been stirred by the attacks on the vote. “Our country has changed,” Supreme Court Chief Justice John Roberts pontificated on June 25, as a transparent pretext for gutting the 1965 Voting Rights Act–not long after another Supreme Court decision made it almost impossible to sue an employer for racial or sexual harassment. The Justice Department no longer has the power to reject discriminatory changes to voting laws and practices by a number of states and jurisdictions–a power that had been used to strike down several laws aimed at suppressing the votes of people of color in 2012, and many times before that. While the Obama administration is intervening against voter suppression in Texas and other states, there is one aspect it will not touch: disenfranchisement of convicted felons. Clearly, the election of a Black President and his appointment of a Black Attorney General have not ended racism either generally or in the criminal injustice system. Even after the racist 100-to-1 disparity in crack vs. powdered cocaine sentencing was reduced in 2010 to “only” 18-to-1, the administration is keeping 5,000 people in prison who would be free if the law had been in effect when they were sentenced. With the stroke of a pen, President Obama could pardon them. However, his Justice Department is actually appealing a court ruling that they should have an opportunity for redress. Nor can one be comforted by the trial balloon floated by Obama when he suggested that New York City Police Chief Ray Kelly, champion of stop-and-frisk, would be an excellent candidate to head the Department of Homeland Security. All these facets of regression and revolt not only have brought attention to the Aug. 24 March on Washington commemorating the 50th anniversary of the historic 1963 March. They also guarantee that the struggles will continue long afterwards. Just as the 1963 March was but one high point of a whole Freedom Now movement, today there are many struggles, many debates, many strands of movements, crying out to coalesce into a mass movement that can shake the foundations of this racist, sexist, capitalist society. We can hardly afford to downplay the need for philosophy and let this become another short-circuited movement or another unfinished revolution. All these strands of revolt need not only to unite but to deepen, to raise a banner of total freedom, so as to open the way to a reconstruction of society on new human beginnings. This entry was posted in Articles and tagged African American, American Civilization on Trial, Angela Corey, Barack Obama, Black, Constance Malcolm, criminal injustice system, Florida, George Zimmerman, Jordan Davis, Jose Ramirez, Juan Chavez, Judge Debra Nelson, March on Washington, Marissa Alexander, Michael Dunn, Moral Mondays, New York City Police Chief Ray Kelly, North Carolina, Operation Ghetto Storm, Owen Eugene Whitlock, Police brutality, prison industrial complex, racism, Ramarley Graham, Raymond Herisse, Rekia Boyd, Rick Scott, Stand Your Ground, stop and frisk, Supreme Court Chief Justice John Roberts, Texas, Trayvon Martin, vigilantism, Voting Rights Act, Walmart. Bookmark the permalink.